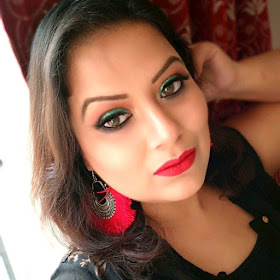 Probably I am the last one in the entire blogging worldwho is reviewing about Revlon matte balm in shade sultry the most rave shade in this matte balm collection. Revlon launches their matte balm range and Revlon Colorburst Lacquer Balms few months which was the most rave and hit products from Revlon. Being a lover of matte I focus myself on the matte collection.It launches 8 beautiful shades in matte collection. The matte collection can be described as the velvety matte range. I choose the shade “sultry “among all as it is a beautiful dusty rose shade which is most wearable shade among all. The shade is so versatile that it can be can carry by any skin tone beauties. A perfect shade for office wear or day wears too. Coming to the packaging, the packaging of the Revlon Matte balm is matte one .The packaging is little bit similar to the Revlon Just Bitten Kissable Balm Stain with twist up. The cap fits tightly too. The body of the matte balm have the color of the shade similar to it thus easy to decide from outside when in hurry. The balm texture is just velvety; it glides super smoothly on lips without any tugging or pulling of lips. The balm yet matte but moisturizing to lips. They are easy to apply, just hold like lipliner, lining the lips first followed by fill the lips with balm and u are done. Next is pigmentation, the lip balm are nicely pigmented. One swipe is enough to go. Like the Revlon just bitten kissable balm stain Revlon matte balms are also has minty scent. I really love the texture and the staying power of these matte balms. It can survive small snacks. It transfers a bit here and there I cups and glasses but very lightly which is why I am okay with that. My thoughts: - Revlon matte lip balms are very nice lip balm which is a mixture of velvety matte lipstick plus balm, easy to carry and easy to apply is totally worth the price. Have you tried any of the Revlon lip balm from matte range? Which one ? please share your thoughts I the comments section below ! I have this shade n one of my fav. ..awesome ..